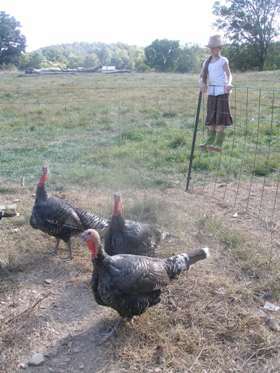 Turkeys are relatively easy to raise on a family farm. However, being that they are ultra friendly and like to hang out around the humans — they quickly earned the name nuisance and ended up in their new home built out of hog panels located in our garden area. It works out great. We aren’t tripping over them congregated on our back steps. And they now add fertilizer to our garden area and scratch through the compost. That is so funny! I can totally see that picture! We currently live in our basement, and when we had turkeys they would congregate in front of the window above my kitchen sink and stare at me all day long. Now they are gone, but in their place our lone goose does the same thing!